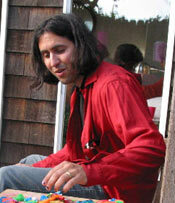 The Second Annual Matthew Sperry Memorial Concert has been scheduled. Here are some details…. All proceeds (including CD sales at the concert) benefit Matthew’s family. Click link below for list of scheduled performances. Update: The East Bay Bicycle Coalition is currently featuring links to this entry on their homepage. Yes, it’s time to get the letter writing campaign under way. I have written a letter, which anyone is free to use as model, but I think if we all write in our own words, the impact will be stronger. Here is a copy of my letter, with the defendants name and my address deleted. Feel free to circulate this in any way you see fit. I would urge anyone writing letters to be careful not to engage in libel. The following letter represents the opinion of its author and nothing more. In Pittsburgh, a city particularly inhospitable to bicycle commuters, cyclists are marking the spots where other bikers have been hit or killed by cars. Old bicycles are painted white and locked to chain link fences or sign posts, then draped with a placard “Cyclist struck here – ghostbike.org.” The images are chilling. GBP is a group of concerned bicycle commuters who have seen lives destroyed by the lack of concern by city government and automobile drivers in general. They see Pittsburgh as a city with an uninviting transportation infrastructure, a government reluctant to accommodate their needs, and a set of laws that leans toward the rights of motorists and ignores unprotected bicyclists. … Bicycling remains a viable form of transportation that can reduce roadway congestion, air pollution, noise, parking needs, energy use, and above all, to provide more daily physical exercise for everyone. Even though Pittsburgh’s Dept. of Public Works has been removing ghost bikes from the sites where they hang, GBP encourages people in other cities to mobilize similar actions. 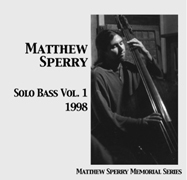 presents Musical Meditations for Matthew Sperry. Myles Boisen, Philip Gelb, Bill Hsu, Gino Robair and John Shiurba , 5 of Matthew’s closest friends and musical associates will present 5 solo pieces, composed in honor of Matthew. This concert is sponsored by Meet the Composer.